He’s known as the “Banker to the Poor.” He pioneered the concept of microcredit: providing modest loans to poor entrepreneurs to allow them to move out of poverty. And for these efforts, most know him as the winner of the 2006 Nobel Peace Prize. In Creating a World Without Poverty, Muhammad Yunus tells the story of why he founded the microcredit organization Grameen Bank, and how it has evolved over time to adapt to the changing needs of Bangladesh’s poor citizens. Yet unlike his first book Banker to the Poor, Yunus directly situates Grameen Bank and the concept of microcredit in the field of social business—a “new kind of business” in pursuit of social goals with limited personal gain. No, social business is not the PR dream that multi-national corporations hide behind, according to Yunus. Social business, he feels, is the solution to the global poverty crisis. Well, is it? The answer lies in Yunus’ analysis of our current global economic crisis. He points to free market economics for failing to address growing social problems. Yet don’t expect him to look solely to government, nonprofits, or multilateral organizations for the solution. Governments can be corrupt, inefficient, and are prone to power politics, according to Yunus. Nonprofits rely on a stream of limited and unreliable donations. Multilateral organizations such as The World Bank are bureaucratic and self-serving. 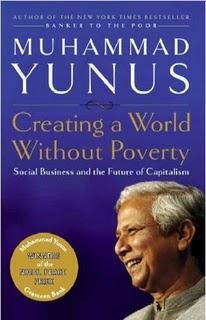 Instead, Yunus believes wholeheartedly in social business. The pursuit of profit should be coupled with the intent to increase social good. Moreover, the poor should have some ownership of microcredit organizations—like Grameen—who loan to them. In this way, Yunus believes that social business can operate in the capitalist system, just so long as it’s regulated, reformed, and fair. Yunus’ analysis, which captures the severity of the current conditions and holds corporations accountable, is well-founded. However, his solution is contradictory. While he argues that it is conflicting for businesses to pursue profit maximization and social benefits, he admits that his model of social business encourages the pursuit of profit in order to repay investors and expand social efforts. Moreover, he encourages corporations like Danone to start offshoot social businesses—like Grameen Danone—without acknowledging the contradiction in creating a social business while maintaining a vast profit maximizing corporation. Other potential pitfalls arise. How can social business succeed and eventually overpower the profit maximizing business model, simply through the belief that people want to do good? Even with a global environmental and economic crisis before us, the systems of power will continue to benefit from exploitative and destructive profit maximization practices. They will not reform on their own, regardless of whether their CEOs believe in the inherent need to create positive change or not. Let’s not forget the words of Fredrick Douglass that “power concedes nothing without a demand.” The type of change Yunus writes of—substantive positive change—cannot arise in a global economic system that is fundamentally flawed. It will not come from a relatively small number of wealthy entrepreneurs and corporations who seek to serve the poor, but from the majority the world’s ordinary people that rise up to demand a real change—accepting nothing less. While Creating a World Without Poverty is an informative introduction into alternative theories of poverty reduction, Yunus fails to prove his claim that the social business model is the solution to poverty. My critique of micro-finance has always been that it won't end poverty through the promotion of capitalism, which itself necessitates poverty. I feel like it's putting a band-aid on a wound, which may be necessary in the short run, but I wonder what the long term effects will be. I also wonder how effectiveness is measured. Since this is a fairly new design, there aren't any longitudinal studies that prove it is actually effective and that the income generated is sustainable after the loan is repaid.I also wonder how the culture is being effected by the shift from a community focus to an individual focus. My point is that it seems that no real conclusion can be drawn about this practice yet. Interesting review, Arwa. Thank you for pointing out the contradictions in Yunus' argument.